Our Winter 2017 Limited Edition products for women. When they're gone they're GONE. Secure yours by ordering NOW! 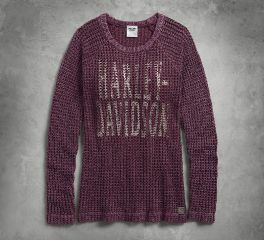 Slip on this Harley-Davidson® Women's Loose Weave Sweater between seasons. Try it over a contrasting cami or tee for a little blend in this acid washed red sweater. It will surely look perfect. 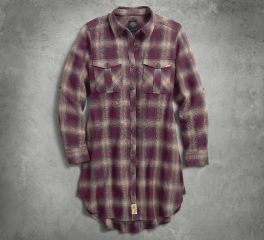 Harley-Davidson® Womens Slim Fit Plaid Roll-Tab Sleeve Maroon Long Sleeve Woven Shirt Dress is 100% cotton. 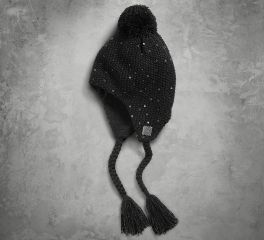 Lined with toasty fleece our winter Sequin Knit Hat offers added warmth with a playful dose of style. The fun popcorn stitch features knit-in sequins for a subtle shimmer. With cozy earflaps, this winter favorite keeps you warm during snowball fights and winter walks. A bouncy pom and braided ties keep this women's knit hat from looking too serious. Make it a gift set – add the Sequin Knit Infinity Scarf. Weather the outdoors in biker style. 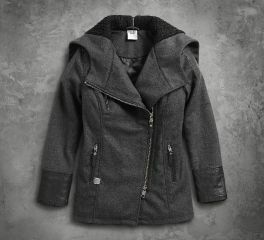 With its asymmetrical zipper, our Wool Blend Pea Coat takes inspiration from the timeless biker jacket. But we add a vintage twist with the retro varsity-style split hood. Leather-like accents add a chic touch that make this women's casual jacket on point for office, girls' night out, or weekend errands.